There was discordant tunes within the militant groups operating in the Niger Delta region following a threat by some militants to launch six missiles in the region, The Nation reports. The militant group, Niger Delta Avengers (NDA), which had claimed responsibilities for ongoing onslaughts against oil installations, Saturday, disassociated itself from threats to launch missiles in the region. It rather asked persons behind the threat to sheathe their swords and key into its motive of crippling the country’s oil production without bloodshed. 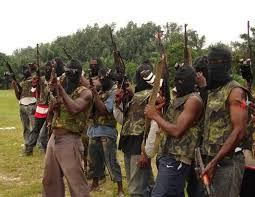 A consolidated group of militants under the aegis of Joint Niger Delta Liberation Force (JNDLF), which claimed NDA was its member, threatened to launch six missiles in the Niger Delta region. The group said it would commence the testing of its six missiles which would last for three days on June 7. Though it did not disclose the nature of the missiles, it warned that no airplanes should fly in and out of the country within the period claiming that the weapons were capable of hitting any object despite its size. It said its fighters trained for that purpose had already arrived the region with its foreign partners through what it described as the country’s porous borders. The group in an electronic statement said it took the decision to further wreck havoc in the region in a meeting attended in Yenagoa, Bayelsa State by its commanders. The militant group said Bayelsa State not Delta State is the command base of the Niger Delta Avengers (NDA) and warned the Commissioner of Information and Orientation in Bayelsa, Mr. Jonathan Obuebite to stop criticizing NDA. The group in the statement which repeatedly referred to President Muhammadu Buhari as Pharoh, said the highest organ of JNDLF, the Joint Revolutionary Council (JRC) concluded that the launching of the missiles would signal its readiness for the final breakup of the country. But NDA in an electronic statement signed by its Spokesman, Murdock Agbinibo, warned other groups to desist from an act capable of causing bloodshed in the region. Agbinibo said there was no need to launch missiles or take life of any person since the military warplanes had not struck in the region. He said: “The military warplanes hovering round our towns and villages have not strike a soul or destroy any property, so those groups with anti aircraft missiles should dry their gunpowder. “When it is time to engage the military in combat the whole world will know they started the war not the Avengers. The Niger delta avengers high command will pass the message round that its time to engage on gun battle when it is time. “So far, we have not engaged the Nigeria military in combat; despite the heavy presence of military on the pipelines. we still find way to carry out our actions without attacking soldiers. The avengers will deal with any group that refuses and attack military.